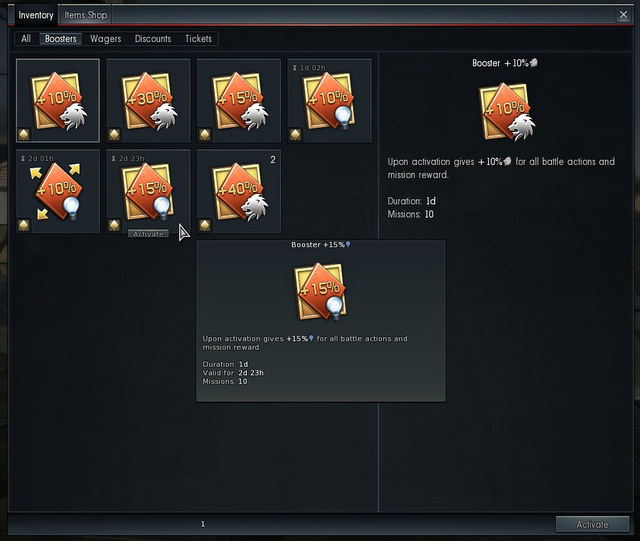 A Beginner’s Guide to War Thunder – Items and Premium Options | Killed in a Smiling Accident. As in many free-to-play games the economy of War Thunder can be slightly confusing, with several types of currencies, rewards, items and so forth. The two currencies are Silver Lions, mostly earned from playing missions and battles, and Gold Eagles, mostly bought with real money. Silver Lions are used to purchase regular aircraft and modifications, to repair and resupply aircraft after battles, and to buy up to two extra crew slots. Gold Eagles have many uses, as outlined later in this post. You certainly don’t need to buy any Gold Eagles if you don’t want to; player skill and teamwork will get you a lot further than just spending money. Like many games of the genre, as you move up the ranks the cost of new aircraft, repairs and the like gets steeper so progress gets a lot slower, but if you’re not too hung up on advancing and enjoying the battles I wouldn’t worry too much about it. If you feel the game is worth it, though, and want to progress a bit faster, by all means buy some Eagles. It’s worth keeping an eye out for sales in the War Thunder store or on Steam to get the most for your money. In Update 1.47, War Thunder introduced Trophies, boxes containing random rewards, similar to lockboxes or crates in many other F2P games. Trophies can contain many different rewards, including Silver Lions, Gold Eagles, boosters and premium vehicles. There are four main ways to get trophies: as a daily reward, as a random after-battle reward, from special events, or from the shop. Each day when you log in to War Thunder you should receive a daily reward trophy. Most of these are small or medium trophies containing one minor Booster (see next section), but after 7 and 14 days you get a larger reward, potentially including larger boosters and wagers. If you’re lucky, you may get a trophy after a battle (the spinning wheel of rewards pops up on the battle results screen). This is a random event, unconnected with your performance. Prior to 1.70 rewards were always Silver Lions, now post-battle trophies can contain all sorts of exciting things including silver lions, modifications, backup vehicles and discounts on premium vehicles. Every now and again, trophies are available in special events. The rewards vary; events often have several stages, each of which requires e.g. 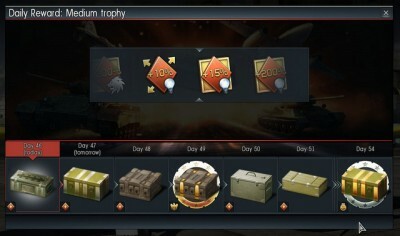 25 air kills, or 15 match victories, with a trophy reward for each stage. The final trophy may contain a guaranteed premium vehicle, with trophies along the way having a very small chance of containing the vehicle. Keep an eye out on the game launcher or War Thunder homepage for news of events. Trophies can also be bought for Gold Eagles in the item shop. The current set of trophies cost 299 Eagles, and might contain high tier premium vehicles worth much more than that. The key word, of course, is *might*; the trophies are a lottery, and the chance of actually getting the vehicle is remote. If you have Eagles to burn then by all means buy a couple for fun, but if you really want the premium vehicle then buying it directly from the shop is a more sensible alternative. As the name suggests, Boosters boost either Silver Lion (represented by a lion head icon) or Research Point (represented by a blue light bulb) rewards from battles. Boosters can be found in trophies, especially the daily reward trophies, or they can be directly bought from the item shop with Gold Eagles. Boosters are placed in your inventory, accessed via the crate icon in the top right of the screen. Mousing over a booster will show the details of the bonus (from 10% up to 500%), and the number of matches for which it applies (from 10 matches for the smallest boosters down to a single match for a boost of 100% or more). Boosters from daily rewards last for three days in your inventory, so you haven’t got very much time to save them up. For the multi-match boosters, you have up to 24 hours after the booster is activated to use them. The amount of time left on a booster is shown in the top left corner; if there’s no value, then there’s no time limit. To apply a booster, click on “Items” on the menu, then click the appropriate booster, and “Activate”. Wagers are another type of item that can be found in trophies. Most of them are challenges to secure certain achievements such as “Mission Maker” or “The Best Squad” a number of times. You make an initial stake with your own Silver Lions, and the rewards scale up the more times you succeed in the challenge. You should make your money back if you succeed once, and a profit after that. Mousing over the wager will show the requirements (e.g. “You must have at least one vehicle of Tier III – V”), what constitutes success (e.g. securing “The Best Squad” achievement, or winning a battle with at least one kill), and the maximum number of stages you can succeed or fail. Once a wager has been activated, after each battle where you meet the requirements you’ll get a success/fail icon in the top right corner of the results screen. You can keep track of your progress by mousing over the wager in your inventory, or a summary is displayed just over the vehicles in your hangar/garage. The usefulness of wagers depends on your play style and skill. Have a look at the requirements, and think about whether you might be able to meet them. Getting 10 kills in a round is pretty challenging; the “Mission Maker” achievement, for getting both the first and last kill in a match, is particularly tricky. “The Best Squad” isn’t entirely impossible for a solo player, as long as you don’t opt out of the automatic grouping system; it’s not based on overall score, but the number of teamwork achievements for scoring kills/assists while close to another member of the team, if you stick close to your randomly assigned squadmate you’ve got a chance. If you get a wager that seems achievable you might as well activate it; if not, just leave it in your inventory. Golden Battle wagers, most commonly seen in the 7 or 14 day daily reward trophies, are slightly different to other wagers. Most obviously the reward is Gold Eagles rather than Silver Lions, a very useful way of getting a bit more premium currency. You also do not make an initial stake, so “wager” is a slight misnomer, there’s no chance of losing Eagles. 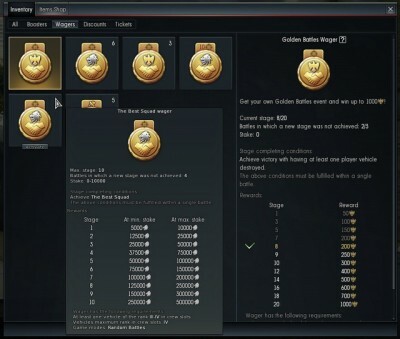 The objective in Golden Battle wagers is just to win matches, nice and simple. If you have two or three skilled friends and can form an effective squad you can heavily skew the odds in your favour, otherwise you’re mostly at the mercy of the randomness of the matchmaker. You need to have Rank III vehicles, so you can’t go and “seal club” brand new players, the best thing to do is to pick the game mode and country you’re most comfortable with, and pray for half-decent team-mates. 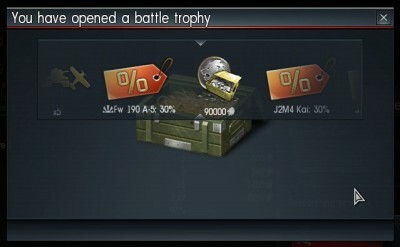 You can spend gold eagles to upgrade to a Premium Account via the “Shop” button, boosting the amount of experience and lions you earn from battles (the results screen at the end of a match has a “Here’s what you could have won…” section, showing how much you would have earned with a premium account). Every now and again (such as for the game’s anniversary in November) Gaijin offer a full year of Premium time at 50% off, quite reasonable value if you’re confident you’ll be playing that long. Each nation has three crew slots to start with, a fourth and fifth can be bought with silver lions, then further crews cost gold eagles. Extra crew slots are most useful in Arcade battles, where each one is effectively a “life”. For Realistic and Simulator battles, with no respawns, then one option is to use a single crew for every aircraft, which means every battle boosts the skills of that crew; one drawback with this method is that you can’t leave planes automatically repairing in the hanger while flying others, so crew slots aren’t completely pointless. Crew XP can be purchased with gold eagles in the “Accelerated Training” option, as per the Crew Skills guide, most useful for the high cost skills like Experienced Gunners and Repair Rank. Expert Qualification, giving a boost to certain skills for specific aircraft, can be purchased with Silver Lions, then Ace Qualification after that with Gold Eagles. The extra nudge from Ace Qualification does not make a huge difference, but if you have spare Eagles and a particular favourite plane then every little helps. 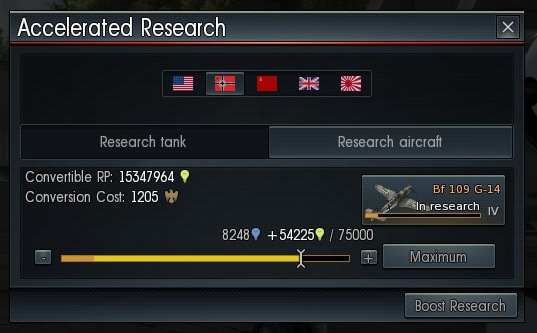 As you gain regular Research Points towards upgrades and new aircraft, indicated with a blue light bulb, you also gain “Convertible RP”, indicated with a yellow light bulb. Your accumulated total is shown at the top of the screen with the yellow light bulb icon; by clicking on this you can spend Gold Eagles to convert it into regular RP, boosting research into the plane/tank you’re currently working on. This is very tempting when you’re really keen to get your next vehicle unlocked but it gets very expensive as you go up the ranks, so should be used sparingly unless you really don’t mind spending a lot of money. You can also buy upgrade modules with Eagles rather than researching them. Again, this can get rather expensive, but if you have a lot more money than time it’s always an option. Two particular upgrades can only be purchased with Eagles: “Backup vehicle”, to be able to use a vehicle more than once in a battle, and “Talisman”, doubling research point gain with that vehicle. Talismans are well worth considering in Tier IV to boost research of Tier IV and V vehicles; if you can find an aircraft or tank that really suits your play style, popping a Talisman on it is a good alternative to buying a premium vehicle. 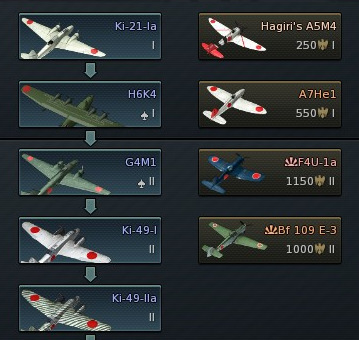 Premium Vehicles are usually shown on the right hand side of a nation’s tech tree with a brown background, and a price in Eagles underneath. They tend to be more unusual or prototype variants of regular vehicles, or captured or lend-lease foreign vehicles. They’re not more powerful than non-premium vehicles, but have a couple of advantages: they start off with all modifications unlocked and available, and usually give better rewards. Premium aircraft can be flown at any time, regardless of your national rank (e.g. if you’re Rank 1 with the USSR and buy the Rank 3 P-63A-5, you can still put it into service and fly it); be very careful in Arcade mode, though, as you’re put into matches based on the highest rank aircraft in your vehicle, so equipping a high level premium aircraft alongside your starting biplanes will result in some painful matches. Occasionally you may find a discount for a premium vehicle in a post-battle trophy. Some premium vehicles are only available in bundles in the store (shown with “Bundle” underneath, rather than a Gold Eagle price). Premium vehicles can also sometimes be earned in events or competitions. 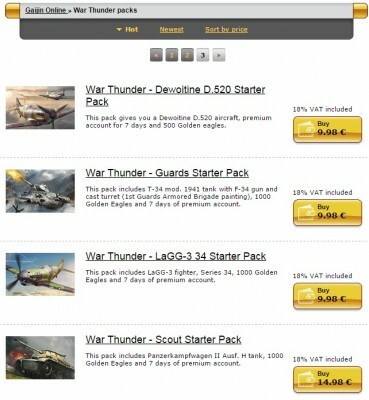 As well as buying packs of Gold Eagles, there are several other items in the online store. 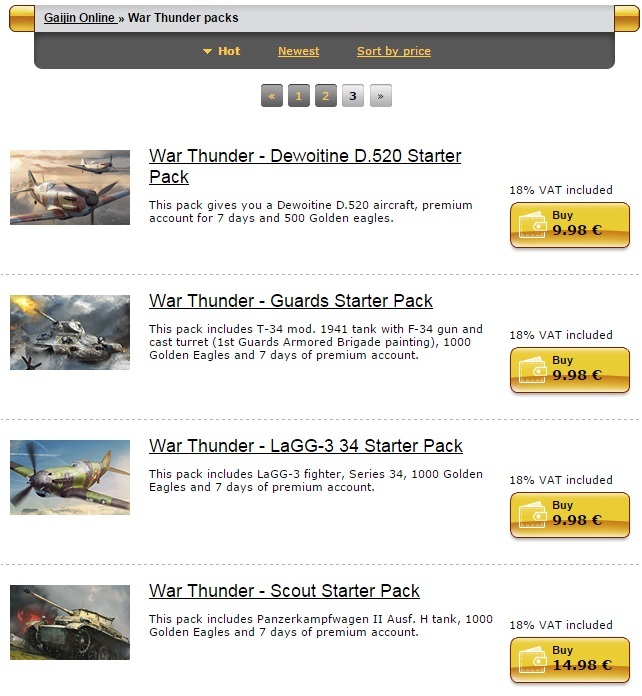 Bundles often represent good value, especially if on sale, usually containing premium vehicles plus decals, Gold Eagles and/or premium account time. There are also a couple of single player campaigns, covering the Pacific theatre from the Japanese and American perspective; there are probably better alternatives if you’re after a mainly single player flight game, but they offer another option if you get a bit tired of PvP. are some people using cheats and if so can anything be done about it ? It’s difficult to know for sure; the important calculations are done server-side (which is why you might sometimes see flashes on your screen as if you’ve hit a target, but don’t actually get any hit/kill credit) so they can’t be interfered with; I vaguely remember some video of an “aimbot”, but that just pointed at the lead indicator in Arcade mode, which is only an indicator and not guarantee of a hit. If you really think someone is cheating you can file a complaint (right click on their name in the scoreboard). You can also view replays after matches, and switch between all the players to see everything that somebody does. I can’t say I’ve ever encountered anyone obviously cheating – but I have bumped into really annoyingly good opponents who rack up massive kill counts through skill. What are the red and blue pictures of tanks and planes with a number next 2 them that you can get in the random box after a match?